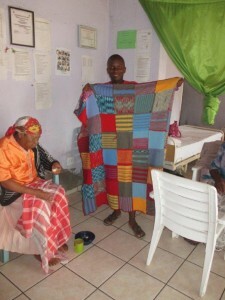 We were fortunate, through Alex Scholtz, to receive a few blankets through the Mandela 67 minutes knitting project, and we decided to donate these to the Hlayisekani Nursing Home in Huntington. This old age home was started by a very enthusiastic and committed young man (24 years old), Panic Nyiko Mokoena. Right now there are 24 old people in this home – the only old age home in Bushbuckridge – and with a team of volunteers, they are provided with a stable, caring environment. The home has just moved into new premises, supported by the Department of Social Development.